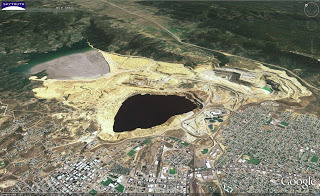 How’d you like to have a fast-growing open-pit gold mine in your neighborhood? 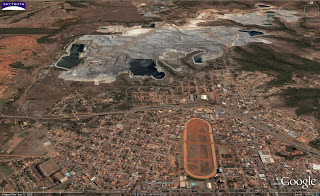 Town of Paracatu with mining operation (gray) in the background. That’s a serious question facing the folks in Paracatu, in the Minas Gerais state of eastern Brazil. Gold mining there has occurred since the early 1700’s, but really kicked into high gear with full-scale open-pit mining beginning in the 1980s, becoming the biggest gold mine in Brazil. Since 2006, a Canadian company, Kinross Gold Corporation, has owned and operated the mine and recently began a major expansion. 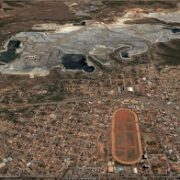 SkyTruth has created a gallery of vertical and panoramic views showing the mine, processing facilities, tailings impoundment, and proximity to Paracatu, a city of about 100,000 people. 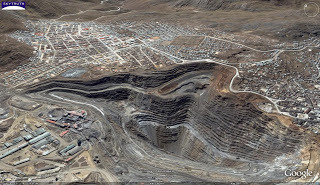 This certainly isn’t the only place where mining and neighborhoods collide. Check out our gallery for Cerro de Pasco in Peru. 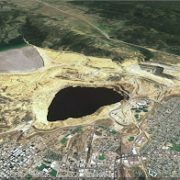 And here in the US, the Berkeley Pit copper/gold mine in Butte, Montana, gradually ate up neighborhoods throughout the life of the mine. Now the closed mine poses a toxic threat to groundwater that has landed in the lap of local residents and US taxpayers. It’s the gift that keeps on giving. 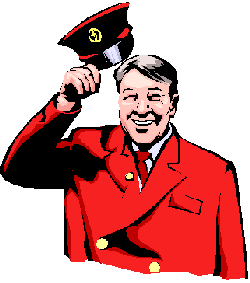 We’ve posted a couple of pics of this gem. …to our friends at ERDAS, makers of Imagine, the powerful image processing and mapping software that we use here at SkyTruth. They provide this at a steeply discounted rate to non-profits like us. Almost everything we do uses Imagine; a couple of examples are our time-series of urban growth in Las Vegas, and our multi-decade analysis of mountaintop removal mining in Appalachia. …and to our friends at Google Earth, who once again have extended, at no cost, the license for us to continue using Google Earth Pro for another year. Check out a couple of the ways we’ve used Google Earth Pro: for mapping coal-combustion waste disposal in high-risk flood zones, and showing residential development encroaching into the habitat of the endangered Preble’s Mouse. 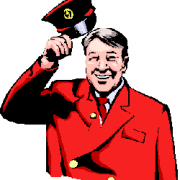 A big tip o’ the hat to companies like these who make a real effort to support the non-profit community.